No matter what the size of your business, attending an exhibition or trade show is a huge expense. As a business you need to make sure you spend wisely and get a return on your investment. This is why we believe you should always have an essential exhibition kit that you’re able to reuse again and again whilst maintaining the professional look your brand deserves. Here at XL Displays we want you to get the best available exhibition display system for your money. We know that budgets are often tight and as a successful business you need to be able to get more for your money without the stress of constantly changing the display products you have. With this in mind we have come up with some essential exhibition display products that together can make one impressive exhibition stand but can be stripped back to be used for a smaller promotional event. Our aim is to make sure you have an exhibition kit that will allow you to look the part whether it is in a large exhibition hall, at a small trade show or simply at a conference centre. Our suggested exhibition kit will cover all marketing scenarios and allow your brand to be marketed effectively and professionally at all times. Pop Up Display Stands are an industry standard for exhibition stand displays. They are an ever popular option with businesses and marketing companies because Pop Up displays give you an easy to set up portable display giving maximum exhibition backdrop coverage. With the ability to go in the back of any car the pop up display stand is the ultimate large format portable display stand. 5 different size options are available in both curved and straight designs to suit any promotional application. Available with a range of different accessories including lights which are used to enhance your graphic display. We offer shelving units which can be built into the pop up stand itself to display product or literature. A monitor bracket is the perfect pop up accessory as it allows you to use a TV screen to showcase your products and service live throughout the show. Our bestselling 3x3 Pop Up Stand is available in a curved or straight configuration and can be upgraded to the exhibitor kit which includes lighting as well as a graphic wrap and beech top that converts your transportation case into a counter. The pop up system allows you to have a replacement set of graphic panels that are interchangeable from show to show - perfect if your marketing message changes frequently. You can reuse the pop up frame with as many sets of graphics you like which will save a large part of your marketing budget for the year. Pop up display stands are a salient marketing tool one of which every company should have access to when exhibiting. Brochure stands are the perfect choice for displaying your corporate leaflets and brochures. They enhance the look of an exhibition stand and as they are portable and freestanding require a minimal amount of floor area on your display stand. Available in a range of sizes - A4, A3 and A5 with options for folding and fixed freestanding in a choice of aluminium or acrylic finishes. 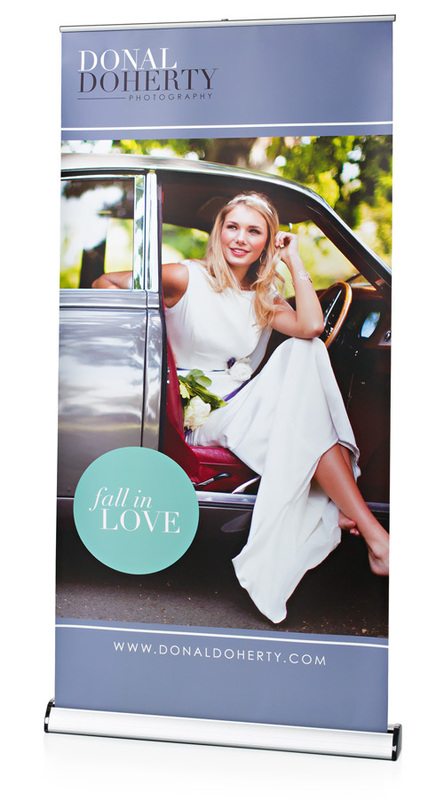 Zed Up A4 literature stand is one of our most popular leaflet dispensers. It’s a highly functional, double-sided literature holder with 6 x A4 shelves and collapses down into the paddy carry bag provided so it can be easily transported – making it ideal for exhibitions. The Zed Up Lite A4 leaflet dispenser is another popular and cost effective stand which is perfect for displaying corporate leaflets and brochures at exhibitions and marketing events. We offer a wide range of roller banner stands all of which are an easy to use, cost-effective and a highly portable display solution. Our printed table cloths are a great addition to any exhibition stand and can be used for almost any marketing application. It’s a great way of adding style to your stand and with prices starting from £50 it doesn’t cripple your budget. Our custom printed table cloths are branded and personalised with your logo and provide a professional look for your business. A simple finishing touch that will add style and professionalism to your display. We only use UK woven quality cloth which is made from a hard wearing 205g polyester cloth fabric with a brushed cotton, luxurious finish. We offer a 5ft printed table cloth and a 6ft printed table cloth which are available in 33 vibrant fabric colours. Our branded table runner is available in 8 stock colours. 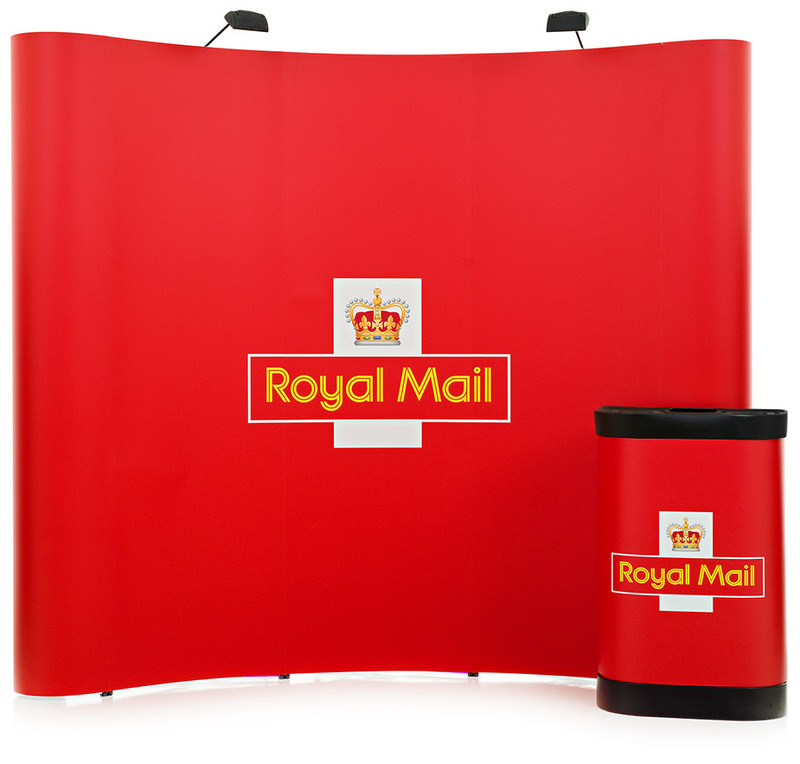 The versatile product can be used for anything from a small craft fair or conference to a large scale exhibition stand. 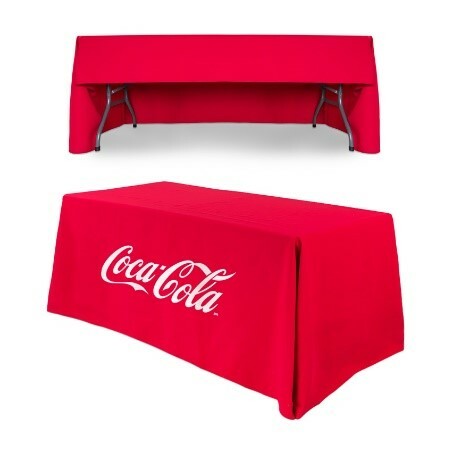 We also offer a folding exhibition table to go with printed tablecloth. Lightweight and highly portable so you can have your own table and do not need to rely on the venue to provide one. They only require a small space on your exhibition stand yet they create an enjoyable customer experience. You are able to gain access to all type of digital media when required and by having this advantage and technology you will have the edge over stands that do not. Perfect for showcasing your website and other products and services that may not be the highlight of your exhibition. For example, you can have an iPad locked on to your website so that visiting clients can view your products and services online. We offer a great range of iPad stands starting from just £54.00. A small price to pay for such a large impact! 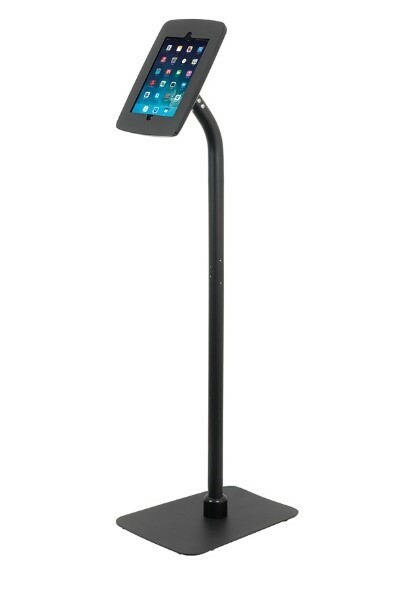 Our iPad floor stand is our popular low cost iPad stand which is available in black, white and silver. Ideal where the budget is tight. Having a promotional counter on your exhibition stand allows you to create a focal point and an ideal meet and greet place on your exhibition stand. Promotional counters are perfect for exhibition stands, they are lightweight and highly portable and can be easily transported from exhibition to exhibition. Most of our counters come with the option of having coloured fabric wraps as well as the option of a branded graphic wrap to promote your business. We offer a wide range of promotional counters all of which are suitable for any promotional and marketing event where you will have visitors and guests. All our roller banners and pop up displays are designed printed and manufactured in-house, we test build each and every one to ensure the quality is nothing less than perfect! Having an exhibition kit that has each of these low cost components means you will have access to an exhibition display that will remain professional and impressive no matter the size of the space and the products you can fit into it.